Mercer further provides advice based on experience on hand digging versus rototilling, and the pros and cons of growing herbs versus buying them during the growing season. She offers good suggestions on plant placement with respect to height, color and bloom time. I admire her honesty in admitting that she willingly moves her plants around to different parts of the garden if they outgrow a certain area or just don’t look right. For some reason, many gardeners act embarrassed if they admit that they have to “retrofit” certain plants in their garden by moving them. It’s no big deal. We all do it. Mercer also provides a helpful introduction to roses and a nice suggestion on having an annual cutting bed garden. There are two ecological notes of caution that should be noted, one of which Mercer briefly discusses in the Groundwork Chapter with respect to the use of peat moss. She does mention that peat moss comes from peat bogs that take thousands of years to grow, and is a non-renewable resource, and she leaves it as a gardener’s choice as to their use. This book was written 15 years ago, and in that time, many, many acres of peat bogs and other wetlands have been lost around the world at an alarming rate. As a wetland scientist, it would have been irresponsible of me to leave this subject without addressing it further. For years, peat moss has been sold in huge bags at nurseries, discount stores, garden centers and even gas stations and used as if it were the panacea for garden soil amendment when it is not. While it does not have to be spread over the entire garden as implied by its widespread sale, peat moss does have its use in gardening when used in a practical manner. For example, when planting acid-loving shrubs such as azaleas and rhododendrons, mixing peat moss with the soil is almost a requirement, unless you are certain that your soil conditions are ideal for these plants. It should be noted that in our area of Southwestern Pennsylvania, our soils naturally tend toward the acidic, and peat moss is acidic, so before randomly adding more acidity to your garden soil, a soil test would be a good idea. For $9.00 a standard soil test kit can be obtained from your local Penn State County Cooperative Extension. Only a small sample of soil has to be collected and forwarded to the Penn State University College of Agricultural Sciences where it will be analyzed and the results will be forwarded back to you, and are now also available on line. You can specify what type of garden you are planning (i.e. vegetable, perennials, etc. ), and have the analysis run specifically for what soil amendments would be recommended for the current analysis of your soil. Better yet, you can use the best soil amendment of all: compost. It’s free if you make your own, and you will fully be gardening from start to beginning all over again. The other ecological note of caution concerns the list of “Plants at a Glance” provided at the end of the book. Many of the plants that are listed are plants that are invasive plants that are causing significant disturbance to native plants and ecosystems. Planting of the following is not recommended in Pennsylvania: Gout weed or Bishop’s weed (Aegopodium podagraria), Crown Vetch (Coronilla varia), Burning Bush (Euonymous spp. ), English Ivy (Hedera helix), Shrub Honeysuckles (Lonicera spp. ); Privet (Ligustrum vulgare); Purple Loosestrife and cultivars (Lythrum salicaria). Further information on these and other invasive plant species can be found on the “Plants You Should Love to Hate” Fact Sheets on this website. This book was first published in 1994. I am curious, as some other readers may be, as to how Mercer’s garden has progressed through the years. An updated, expanded second edition would be welcome. An update could also revise the plant list to delete invasive species and provide an awareness of the problem. 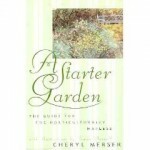 All of Mercer’s practical advice for those starting their first garden makes this an entertaining and informative read, but I’d like to know what that starter garden is like today. Posted by Annette on Sunday, March 8, 2009, at 5:06 pm. Filed under Book Reviews, Uncategorized. Follow any responses to this post with its comments RSS feed. You can post a comment or trackback from your blog.